I try to not comment on anything in the political realm in this blog, but I feel it is necessary to do so at this time. Currently we have a president elect who has stated that he doesn't want tax payers to fund politicized research, and I agree. He claims that Earth Science is politicized. But the Earth science research done by NASA is not politicized at NASA or by the researchers using tax payer funded grants conducting the research. Instead it is politicized outside of the research world by politicians, lobbyist, and corporations. If Earth sciences is in fact cut from NASA, many scientist, engineers, secretaries, janitors, grants office personal, graduate students, professors, ect. would loose their jobs, or in the case of professors, their summer salary. This would not just affect scientist at NASA but also those who fund their research from NASA grants, and their institutions which typically take a 50% cut or overhead from these NASA grants to help run their facilities. NASA is one of the larger grant funding agencies in the US which means that it helps to fund research outside of NASA - quiet literally funding their competition. This is something that hasn't been talked much about within the national conversation. NASA does a ton of cool science itself, but it helps fund so much more cool science throughout the country, in all 50 states. And I bet you there is Earth science done in all 50 states that has been funded by NASA. But how does all this help extend NASA's reach? This data is available to anyone. When I was doing my PhD in Australia I had access to this data. When a researcher at NOAA needs to try to understand an event, they can go get any data they many need from a NASA mission there, no charge and no questions asked. When a researcher at the European Space Agency needs more data coverage, they have access to NASA data, no charge and no questions asked. When High school students or undergrads, or a citizen scientist want to research something, they can get the data at no charge and no questions asked. If a company wants to use this data without having to put up their own satellite, and telemeter down the data and don't want to have to pay for someone then to process the data, they can get this data free of charge and no questions asked. This may not be the best "business plan", but what it does mean is that all citizens (and more) have free access to the data and research that their tax money helped fund. It also means that we have the free flow of knowledge which helps science advance faster - the primary goal of scientist: the pursuit of knowledge and understanding. It costs a lot of money to build an instrument, put it on a satellite and launch it into space making sure the orbits don't collide with anything else up there, or in the ground often in remote locations, collect the data, then process the data into a useable format, store the data for all people to use now and in the future, and keep up the infrastructure to continue to do this well into the future. This is a cost which many do not and can not take on. It is one of the major reasons we have some of the most successful researchers in the world! 1) NASA funds not just themselves, but their competitors through their grants program, meaning that they are a very large job creator. 2) NASA's open data and research policies mean that anyone, any corporation, or any research group benefits from them collecting data and has free access to use this data for their own research/needs. But others have differing opinions on why NASA should continue to do Earth Sciences. I also agree with the points made by James Dyke, the author of the conversation piece below. But the point remains, NASA should continue to do Earth science research! Will President Trump really slash funding of NASA’s “politicised” climate change science? It certainly has been politicised, but not by the scientists conducting it. Blame instead the fossil fuel industry-funded lobby groups and politicians that have for more than a generation tried using doubt, obfuscation or straightforward untruths to argue that humans are not in fact causing significant changes to the climate. That is what must irk Trump’s team of sceptics. NASA’s organisations such as the Goddard Institute for Space Studies and Jet Propulsion Laboratory have made seminal contributions to our understanding of how humans are changing the Earth’s climate. All funded by the US taxpayer. De-funding NASA’s climate change science is effectively sticking your fingers in your ears and whistling Dixie. The Earth’s climate is indifferent to politics and will continue to respond to human emissions of greenhouse gases. All that would happen is US leadership in this area would end, with the risk that not just America but humanity would be the loser. Specifically, here are five reasons why de-funding (aka wilfully destroying) NASA’s climate change research would be colossally stupid. 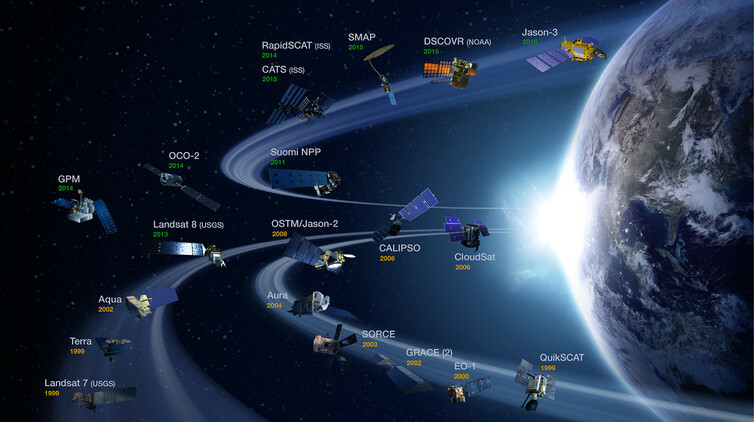 NASA currently operates more than a dozen satellites that orbit the Earth and remotely sense ocean, land and atmospheric conditions. Its research encompasses solar activity, sea level rise, the temperature of the atmosphere and the oceans, the ozone layer, air pollution, and changes in sea and land ice. All of this is directly relevant to climate change, but also represents vital research on these different components of the Earth system itself. Billions of dollars have been sunk into these programs which produce data that is used by an international community of scientists studying many different aspects of the Earth. Okay, we can’t turn all these satellites off, but we can stop the Administration using its data to progress climate change science. NASA was created with the National Aeronautics and Space Act of 1958 with a remit to develop technology for “space observations” but not Earth science. That was the job of other federal agencies. But the model of cross-agency research failed during the 1970s due to a lack of funding. Budgets were cut and NASA ended up conducting some of the science that was made possible by the data it was collecting. Moreover, it was told to put more emphasis on research towards “national needs” such as energy efficiency, pollution, ozone depletion and yes, climate change. As such, Earth and climate change science is one of the central remits of the agency which has become a global leader in it. NASA is world famous, largely because of programs such as Apollo which put humans on the Moon. But its fame extends well beyond those interested in space flight. NASA attracts some of the world’s best and brightest Earth and climate change scientists because its operations offer unparalleled breadth and scale of research. And saying “I work for NASA” is still pretty cool. De-funding climate change science would mean putting many scientists – some of whom are just starting their careers – out of work. Some would be happily gobbled up by other agencies in other countries, in fact I’m sure overtures to some staff are already in the post. This would be America’s loss. A visit to climate.nasa.gov will immediately show how effective NASA’s communication of Earth science has become. Climate science is complex. NASA along with other US agencies such as the National Oceanic and Atmospheric Administration produce unparalleled visualisations of climate change. These are used by other agencies and communicators around the world and further increases the profile and reputation of NASA and the US as leaders in Earth science. It’s easy to get misty-eyed about some of NASA’s operations. Apollo was a staggering achievement. But while US astronauts visited the Moon “for all mankind” we should remember that the space race was driven by the cold war and rivalry with the USSR. The fact humans have never returned to the Moon should tell us that there isn’t much to be gained from such fleeting visits. In terms of legacy, I think Eugene Cernan, the commander of Apollo 17 and so the last human to walk on the moon, summed it up best: “We went to explore the Moon, and in fact discovered the Earth”. It was one of the crew of Apollo 17 that took photograph AS17-148-22727 as they left Earth orbit on their way to the Moon on the December 7, 1972. This photograph is now known as the Blue Marble and has become one of the most reproduced images in all of human history. There have been profound changes to the Earth since that photograph was taken. There are nearly twice as many humans living on it. The number of wild animals has halved. Concentrations of CO₂ in the atmosphere are higher than they have been for many thousands of years. And yes, the Earth’s surface and oceans are warmer, glaciers are melting and sea levels rising. 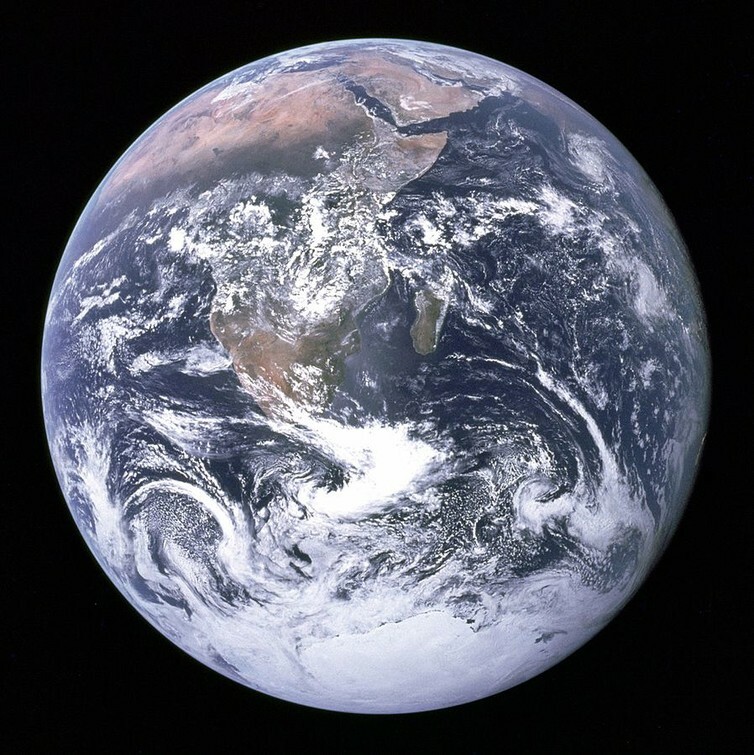 The Blue Marble, like all of NASA’s images, was released to the public domain. Free to be used by anyone. The science that NASA conducts on climate change is similarly shared across the world. Its Earth and climate science represents the best of not just the US, but humanity. We need it now, more than ever.